A top-down racer with no brakes. The Switch version of BAFL: Brakes Are For Losers will launch via the Nintendo eShop on April 19 for $4.99 / €4.99, publisher Playdius and developer Oudidon announced. BAFL: Brakes Are For Losers first launched for PC via Steam in October 2017. BAFL: Brakes Are For Losers is all about pure racing fun. Inspired by classic top-down multiplayer arcade games with insane tracks, gather up to eight players for a hectic racing party, compete in championships, upgrade cards, and use dirty tricks to break friendships. 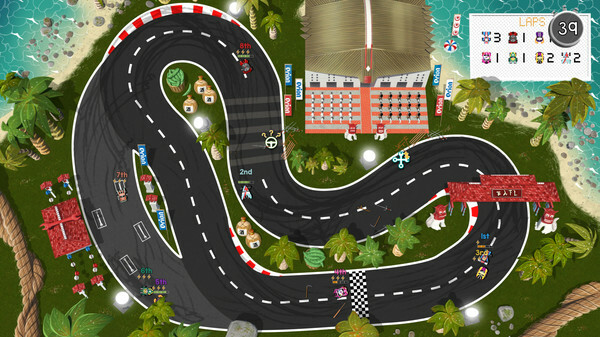 BAFL: Brakes Are For Losers also offers a challenging solo experience with championships against fierce AI competition — and special modes, such as Time Attack or Perfect Race. Run in unique tracks inspired by the pop culture of the ‘80s and ‘90s along with funny details and surprising events. Tour through a wide variety of environments ranging from a tropical Caribbean island all the way to the Moon! Following a successful launch on Steam, independent developer Oudidon is excited to welcome Nintendo Switch players to the party with an invitation to race through its state of the art party racer inspired by epic arcade games of the past. In BAFL – Brakes Are For Losers, there are no freaking brakes! Did we mention? No. Freaking. Brakes.